When discussing swing gates, the fencing and gate industry are usually referring to larger commercial metal gates that swing to open or close. 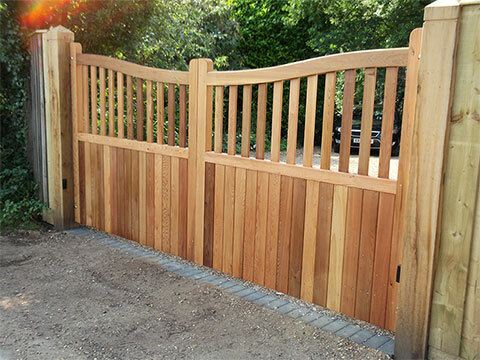 It's a common misconception that swing gates are industrial steel gates, as it can also mean smaller timber gates that, as the name suggests, swing open or closed, and these smaller swing gates are usually manually operated. 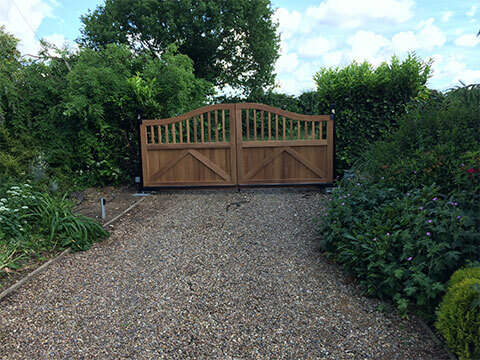 Whether they are metal or wooden swing gates, automated operation should be considered for ease of opening, convenience and increased security, especially if the gates are large and heavy. 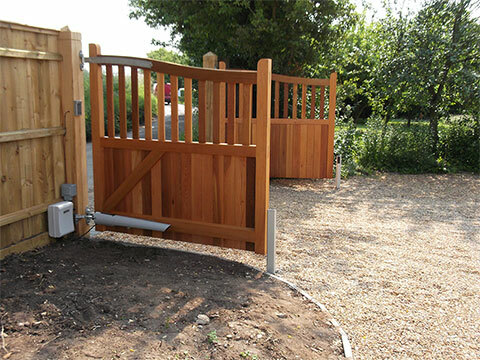 Swing gates may not always be the best option when installing a gate. A good example of this is if space is at a premium, not allowing enough clearance for it to swing open, or if the bottom of the gate catches the ground if the gate is installed on a slope. If this is the case then a sliding gate could be a better option. If you would like more information then you can give our friendly sales team a call or complete a Enquiry form and we will be in contact. Automatic swing gates come in a wide variety of designs, styles, models, and brands. Each type also has various features that allow you to find the product that will best work for you. This automatic door system offers a lot of benefits for every homeowner. One of the obvious benefits of an automatic swing gate opener is that it provides ease and convenience for homeowners. An automatic swing gate gives high level of security to your home. With the help of this useful door system, you can prevent vandals from having access to your home. You can install a keypad access and a security camera for people whom you allow to have access to your property. You can keep unwanted individuals from entering your property. In addition, keeping your children from wandering on a busy road is another safety benefit given by an automatic swing door opener. With the use of this system, you can have peace of mind all the time. The use of an automatic swing door opener can help you keep your family safe from any undesirable circumstances. However, it is not only the benefits offered by this useful system. It can also increase the value of your property. Your home will look good and orderly with the use of an automatic swing door opener. Automatic swing gate will never be out of style. You can even find contemporary and elegant designs that can enhance the appeal of your home. An automatic swing door opener helps keep your precious ones safe and vandals away. It also adds value to your property by increasing its safety and security features.